Jeffco Java TOWER Styling Station w/ Java Wall-Mounted Mirror & Ledge. The vanity features a full-extension drawer, storage cabinet w/ adjustable shelf, convenient angled tool panel w/ holders for blow dryer, two curling irons. Electric by customer. 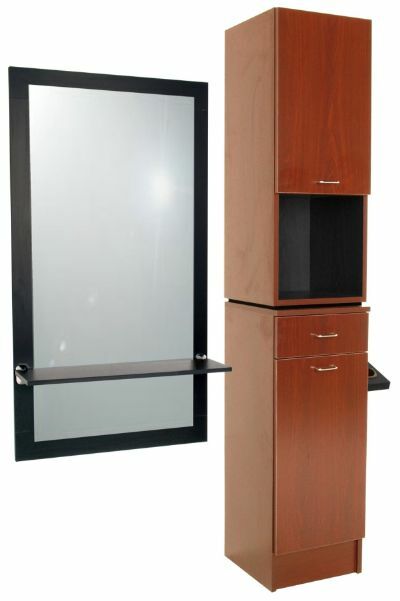 Includes black work area above drawer, upper storage cabinet w/ adjustable shelf, and J05 Java Mirror & Ledge with 24" x 48" mirror. 15"W x 15"D x 78"H plus 5" wide angled tool panel. The Java Mirror & Ledge Assembly measure 28"W x 52"H.